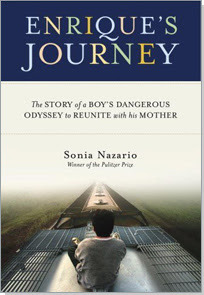 San Diego has launched a “One Book, One San Diego” campaign with the book “Enrique’s Journey by Sonia Nazar io. I joined with “all of San Diego” and picked up this short non-fiction telling of a Honduran boy’s journey from Tegucigalpa to the U.S. in search of his mother who immigrated before him. The tale left me chilled, upset, and with more than a little hope. Much of the story takes place in Tegucigalpa, a city I left behind just short of a year ago. Nazario’s rendering of “Teguc” sat oppressively on my chest, filling me with homesickness for a place I had only begun to know. Her telling of the commonplace daily life in abject poverty coupled with descriptions of places and sights I knew well made Tegucigalpa live in my present. I could almost smell the acrid smoke of burning trash, feel the burn of the tropical sun, hear the chatter of rapid slurred Spanish mixed with honking horns. As Enrique journeys north to find the mother who left him when he was five, the one he is sure will fill the aching whole he feels in his life, he encounters unimaginable horror. He is repeatedly assaulted, robbed, stripped naked, and deported back to his Guatemalan starting point. Once he is beaten nearly to death by members of a mara, a Central American gang. These dangers all compound the already life-threatening journey atop freight trains that maim and kill thousands of migrant s each year as they make the illegal trek. 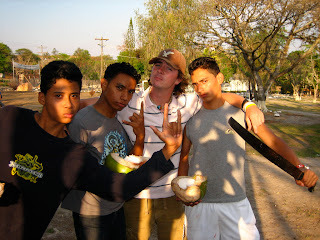 So many of “my boys” at El Hogar wanted to come north. Most asked for my phone number repeatedly. I didn’t sleep well last night. “Enrique’s Journey” left me more anxious than I can remember being in a very long time. I don’t know if I fear directly for my boys, or if Enrique reminded me about the fragility of human life and the presence of those who work exceedingly hard and who still live in the bleakest of poverty. The Church ends up the real hero of Enrique’s journey. In two places, Veracruz and Nuevo Laredo, Mexico, we hear of communities who are reaching out to their migrant neighbors. Leaders in the Church set an example by throwing food and clothing to passing trains, or by sheltering those who are held up in making the final push to the United States. Their communities followed, and Enrique’s journey is a testament to the Gospel LIVED OUT by Christian communities making the option for the migrant poor. Am I doing enough? I think part of my lack of sleep came from feeling so detached from these communities, from a sense of guilt because of my wealth. Last year I lived among so many who were planning or had made the trek north. Enrique’s Journey gave me new insight into what this via crucis actually entails. I feel so disconnected from those who suffer so much here in the affluence of San Diego. I am lucky that I will spend part of this summer in El Salvador and back in Honduras, that I can visit the children at Dorcas House in Mexico whenever I want, but I don’t go enough. My privilege isolates me from the poor, among whom Christ dwells. I must continually ask God to surmount my fears, excuses, and misgivings. I must repent of all that isolates me from the reality of so many people’s lives if I am to hope to have a glimpse of God’s dream for the world.